1) When and where will be the first question no doubt. Experienced caterers will have worked with reception halls or hotels before, even better if they’ve worked at the reception venue you’ve chosen. If this is the case the caterer will know what to expect and what they can do in that space. 2) How many guests will be the second question. This will give the caterer an idea of how much food will be needed to feed the people attending, and it’s important to your budget since the majority of it will be spent on food. 3) What does you budget look like. This will determine what you serve and what you can and can’t afford. Even if your desired dinner is off limits, it doesn’t mean that you can’t have a delicious meal served. 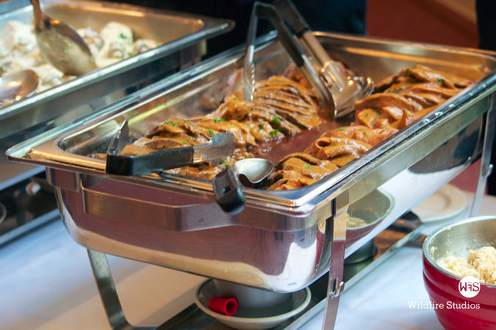 Ask you caterer for suggestions and what they feel comfortable doing with your budget. It should be what the caterer can do with your funds that makes them the best for the job. 4) The caterer might ask about your expectations for your reception, don’t hold back tell them what you envision in your mind. From this the caterer can get an idea of what you’re looking for and how close to that they can come with the finances you have available. 5) Lastly, the caterer might ask about what you don’t want at your wedding feast. It’s important to realize that just because you don’t want to serve chicken means that you’ll be able to afford the alternative, beef or fish, which is typically more expensive. Listen to what the caterer tells you, they know their business better than you so when they give you food advice, listen. You can always ask to taste samples so you know exactly what you would be getting. Being prepared for these questions not only gives the caterer the information they need to work their magic, but it also gives you a better idea of what your wedding meal will look and taste like.